Over the past couple of weeks I have been developing an arduino powered autonomous rover. * I started out with the uno but later switched to the pro mini as it is easier to power. Most other arduinos should also work. **You can buy continuous rotation servos, or you can modify normal servos for continuous use. There are lots of guides out there on how to do this so I will leave it at that for now. **** I used a sheet of expanded pvc but any rigid workable material should do. The circuits are very basic, below is a breakdown of each section. 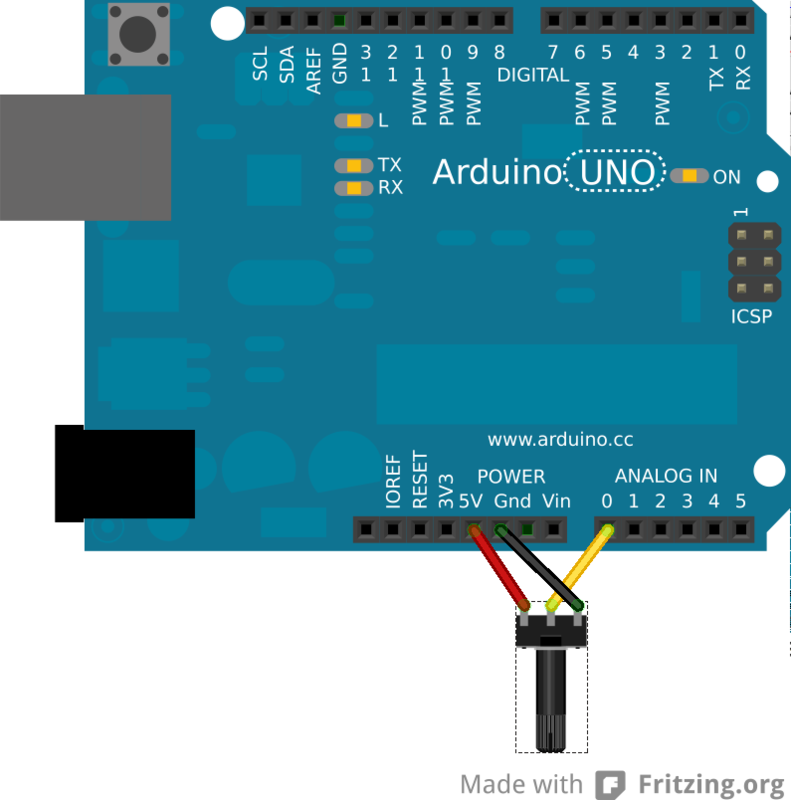 I found the Arduino UNO fairly annoying to power with the servos, since it is recommended to have 7v+ to power the arduino on the Vin pin and the servos are rated at 6v max. I solved this by connecting the battery directly to the usb port on the arduino uno and later switch to a 5V pro mini. I had some trouble with the power supply on the arduino uno in that the arduino uno is recommended to be powered by 7-12v via the Vin pin or the 5.5in power plug. But the servos are rated at 4-6v and cannot be powered by the arduino Vout pins as they draw too much current. I solved this on the arduino by hacking up a an old USB B cable and using that to power the arduino uno from a 5-6v power supply (4 AA batteries). Later on I switched to the arduino pro mini 5v, which supports 5-12v on the RAW pin. The servos control the rovers movement. 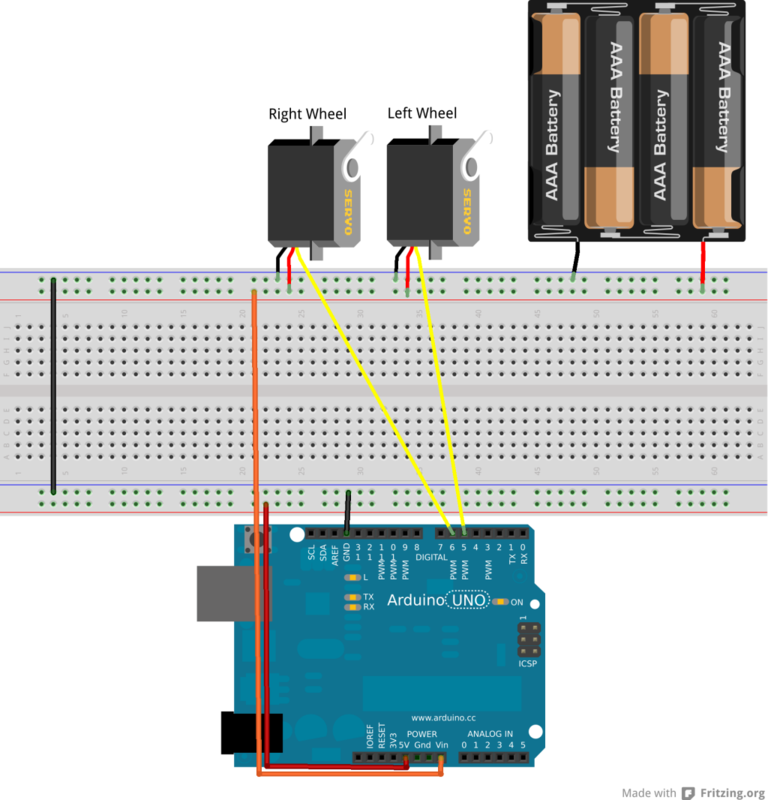 They should be powered directly from the power source (4-6v) rather the from the Arduino as they can draw more current then the Arduino can provide which can cause it to randomly reset. The ground pins should be connected to the power source as well as the Arduinos ground pins. The left servo to pin 5 on the Arduinos digital pins and the right servo to pin 6. The Switch is used to start/stop the rover and the bumpers are used in object avoidance. 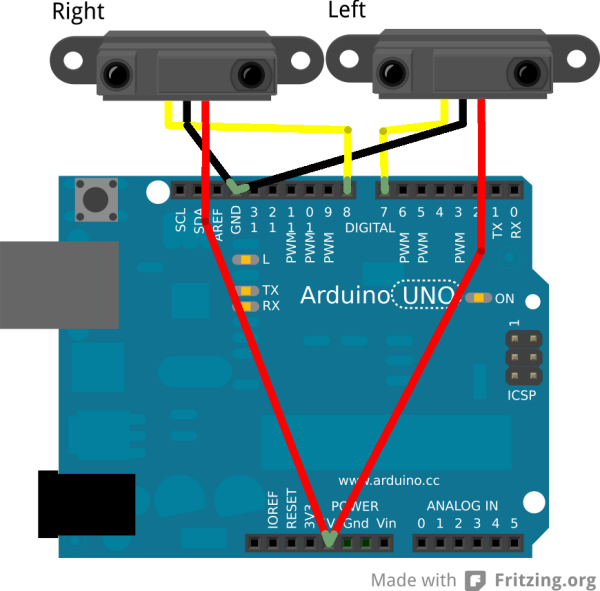 One end of the switch and bumpers should be connected to the ardunio's +5v pin and the other end to the Arduinos digital pins 2 (switch), 3 (left bumper) or 4 (right bumper) as well as through a 1k resistor to ground. The range finders are used to detect table edges to avoid falling off surfaces and should be mounted facing down at the front of the rover. I used an uncommon ir range finders in that they do not report the distance back, but instead drive the input pins high if there is an object within 5cm or low otherwise. This makes the code much simpler since we only really care about this cutoff point. You could replace these with normal range finders, but you would have to modify the code to make use of them (I recommend the NewPing library if you do decide to use them). The power pins should be connected to the Arduinos +5v pins and the ground to the ground pins. The left range finder to the digital pin 7 and the right one to digital pin 8. The potentiometer is used to control the speed of the over. Its outer pins can be directly connected to the arduinos ground and +5v power supply and the central pin to the Arduinos analog pin 0. 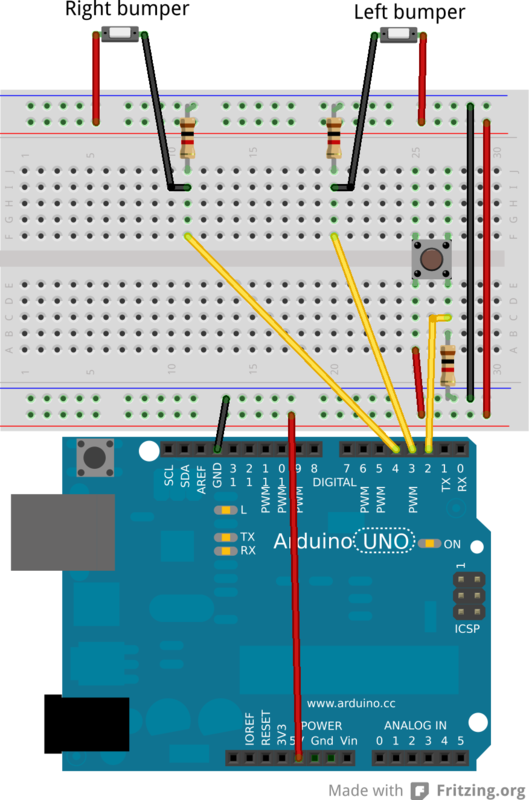 You can optionally connect two LEDs from pins 12 and 13 to ground, or use the LED built into the arduinos 13th pin which shows when the rover is running or not. The 12th pin is mostly used for debugging so is not needed. The code should be built then uploaded to the arduino and the rover should start moving when you hit the switch (and the LED on pin 13 should light up when it is moving), press it again to stop it. If the led lights up but it doesn't start moving, make sure the potentiometer isn't set to its minimum position. If you would like to see me attempt any of these or any other idea you have or just want help creating your own feel free to contact me and I will see what I can do.